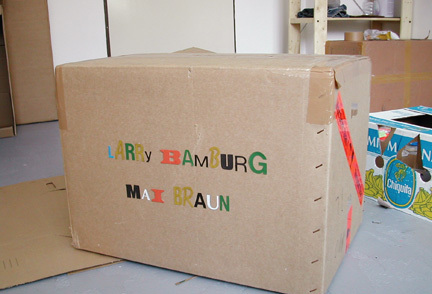 Exercises in Resourcefulness brings together two artists, Larry Bamburg and Mai Braun, who push the limits of what can be done with some paper, a simple electrical fan, cardboard boxes, or even, some strings. Both artists deliberately opt to work within this particular materialistic vocabulary. We might want to call them formal situationists as their artistic output is an immediate response to the specifics of the surrounding space and the peculiarities of the mundane materials at hand. The final shapes evolve during the installation; mistakes that happen along the way are incorporated into the finished piece. Braun and Bamburg’s work is a continual examination of the relationship between the process of making and the employed materials. Braun and Bamburg coalesce the directness of their minimalist language with something that is hard to put into words. In order to complicate their essentially abstract compositions, both insert graphic imagery into some of their installations. The association between the irrefutable presence of these images and the physicality of the nonrepresentational components creates a visual ambiguity. No longer is the figurative image what it ought to be as it tumbles into an interpretive freefall. The unresolvedness of this juxtaposition opens questions about the pureness of form and the truth of images. With the installations’ awkwardness, triggered by the disjointed narratives, Braun and Bamburg create humorous situations through formal decisions. The unexpected combination of a few simple gestures gives the viewer a means to re-focus his or her attention. Braun and Bamburg’s arcane constructions are stubborn understatements that constantly move between the minimal and the maximal.